Principal Cast : Voices of Woody Allen, Sharon Stone, Sylvester Stallone, Gene Hackman, Danny Glover, Christopher Walken, Jennifer Lopez, Anne Bancroft, Dan Aykroyd, Grant Shaud, Jane Curtin, Paul Mazursky. Synopsis: Z, a lowly worker ant, yearns for something more – a chance encounter with Princess Bala, and accidentally going to war against termites, gives him the courage to stand up to the evil General Mandible. What we think : Woody Allen’s anxiety ridden Z is the star of the show here, in this precursor to Dreamworks Animation, Shrek. While the animation feels weird to watch, in that the texturing and tone of the film feel more “adult”, the overall result is a pleasing, entertaining, and enjoyable animated adventure into the undergrowth. Animated films have a gestation period almost five or six times as long as a standard live-action film. Before any frame of computer trickery is delivered, before the prints are struck, first, the filmmakers have to come up with an idea. After that, they have to develop the story, figure out the storyboards and record the voice cast, to ensure that by the time the rendering of animation begins, things are locked in stone. After all, when these films can cost millions of dollars, you want to be sure you get it right the first time. How, then, did two separate studios in the largest movie production system on Earth manage to come up with two similar films in the space of the same year? 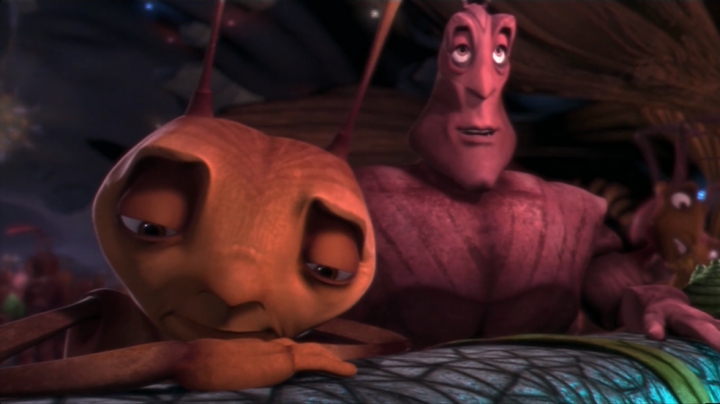 Antz, and A Bugs’ Life, both center their stories on a colony of ants and their associated world. Both feature a central character who likes the Royal princess, and is a blithering imbecile when confronted with this fact. 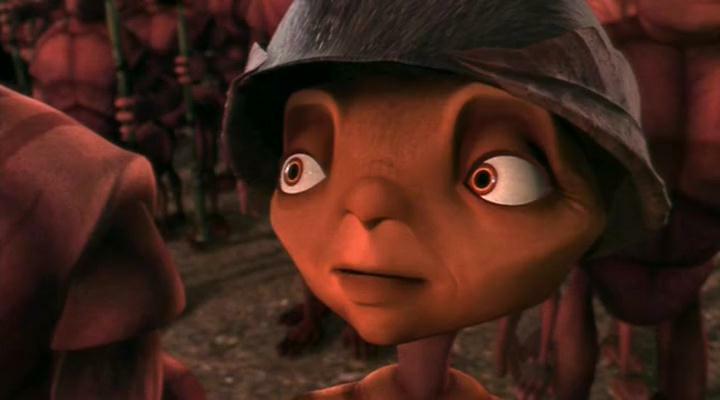 Our hero in Antz, perfectly voiced by Woody Allen, is Z, the middle child of a family of several million, who yearns for something greater than just to dig and work for the good of the colony. Likewise, our hero in A Bug’s Life is Flick, voiced by the hilarious Dave Foley, who also yearns for something more than just collecting food for a group of marauding grasshoppers, led by Hopper (a delicious Kevin Spacey, hamming beautifully). yes, there’s a sense of the unfulfilled in both our heroes, as they set about proving everybody wrong. Of course, they have to convince their fellow ants that they’re both right to do what they do. So which film, if either, is the better of the two? Comparatively, these two films are so close in storyline and characterisations that it’s scary, and you’d be forgiven for thinking one is a sequel or prequel to the other. The strange thing is, both companies claim they had no foreknowledge of the other’s projects on the drawing board. Pixar, fresh off the success of Toy Story (hard to believe that A Bug’s Life is only the studios second major feature!) waited a little longer to release it’s product to the world, while Antz was seen as revolutionary for it’s time, and even proclaimed as a better film than Toy Story. The soft caress of lust. Woody Allen leads a standout cast in what can only be described as a shadowy, unwieldy look at life in an ant colony, told from the ants point of view. Woody voices Z, the one ant in the colony who desires to be different, who dreams of having more than just a pick-axe and hard hat to dig with. Z is part of a work crew building a new tunnel extension for the colony, who bumps into the Princess Bala one night in a bar. Bala, slumming it in the lower depths of the colony because she wants to see how the other half live, is the catalyst for the events that take place in Antz, as Z decides he wants to see her again (after all, he thinks they have a connection after a brief Pulp Fiction-inspired dance sequence) and stops at nothing to broach the palace of the royal family. Z decides to pretend to be a solder ant to impress Bala, by taking the place of his friend Weaver, voiced with stunning humour by Sylvester Stallone, and joining the army in manoeuvres that take them into battle against giant termites. It’s here, I must stop for a moment, and mention that if you were ever to show this film to young children, it’s the termite attack sequence that’s the most confrontational and disturbing. Creatures are torn asunder, dissolved in termite acid and otherwise mangled and mutilated. It’s quite graphic, and is not suitable for younger children. It is, however, an animated tour de force. Of course, Z is the only survivor of the battle, and returns to the colony a hero. As a hero, he gets a meeting with Bala and the Queen, and Bala recognizes him from the bar. Not wanting a scene, Z is kicked out of the palace, although not before dragging Bala down the chute with him. They begin a search for the mystical Insectopia, a lauded paradise for insects that Z has heard of from a drunk guy in the bar. After all, if Z can find Insectopia, then all will be better with the world. Won’t it? 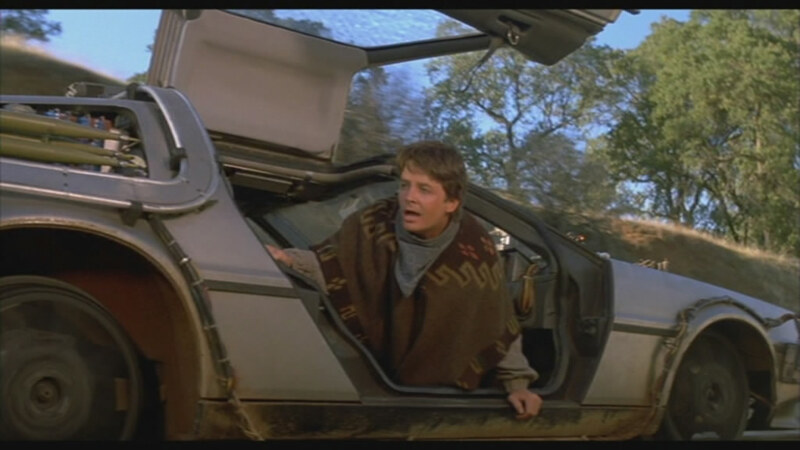 Dodging malevolent magnifying glasses, a picnic blanket and the shoes that go with it (one of the best scenes in the film, for me) and homeless insects, Z and Bala eventually stumble upon Insectopia, and decide to return to the colony and tell everybody. Of course, as with any film like this, not everything goes smoothly, and our heroes brave treachery and deceit from all corners to prove the point. In the end, though, the story ends the way you’d think: Z get’s the girl, the colony is saved from certain extinction (after all, the tunnel extension happens to be underneath a giant puddle of water which threatens to flood the colony out) and the bad guys are given their dues. Yeah, do ants really have muscles? Anatomical fail. Technically, this film isn’t your traditional animated film. Here, shadows and colours are muted, almost shaded in a realistic way that is hard to describe. You haven’t seen anything like it, before or since. The facial animation, which is weird to say the least, is effective in showing the emotions of the characters, but by Pixar standards is low. PDI (Pacific Data Imaging) was the company behind this film, and as an animated film’s technical aspect is evaluated, I have to say Antz is found wanting. 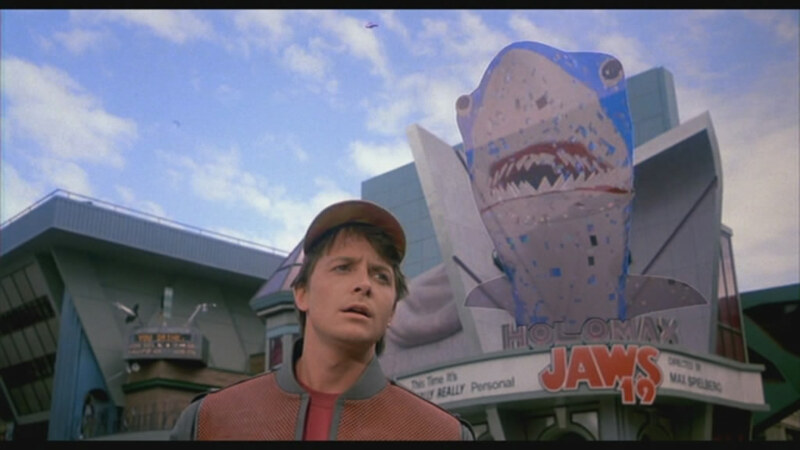 Fortunately, the film’s voice cast and storyline does much to prop up what is a decidedly strange form of animation. Aside from Allen and Stallone, Hackman is accompanied on this endeavour by Sharon Stone, as Bala, Jennifer Lopez, Anne Bancroft, Danny Glover and Christopher Walken. All are uniformly good, bringing a level of gravitas to the story it perhaps would have suffered without. Walken, in particular, is the standout voice artist here in my opinion, creating a sympathetic and yet stern character as the second in command to Hackman. Wonder if he’s off to fight in World War Z? Story-wise, it’s a fairly traditional “one man (ant) can make a difference” tale, with every-ant Z taking on the world and the establishment, and winning. 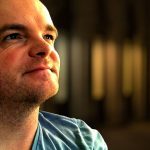 Morally, there’s nothing better than a good old downtrodden guy getting a better life for himself: after all, that’s essentially what we wish for ourselves, and there’s nothing we like more than to see somebody who deserves more, get more. 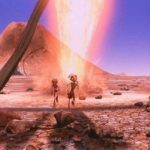 With the sharp edged cynicism present that would permeate the more commercial Shrek movie a few years away, Antz is a sly poke at conformity and not-so-subtle fable about fitting in.. or not fitting in, as the case may be. Parents can be sure their kids will understand it as the film goes along, by merely asking questions about the story and provoking some kind of discussion on the matter. Perhaps the greatest fault of the film is it’s darker tone, something that eventually worked itself out of PDI’s system when they tackled Shrek later. The violent nature of the ant/termite battle, a ferocious sequence that’s quite scary for younger children, seems a mite out of place in what could be construed as fairly pleasant family fare. One must ask oneself (great, you say, now he’s speaking like royalty…) if the way this sequence is shot/edited/directed is warranted to get the point across…. and what exactly that point was? Is Z’s little excursion into battle a chance to see some cool animation and perhaps have an action sequence? Or is there more to it than that: does it develop Z’s character or move the story along. Unfortunately, for me, it’s a little more the former, and a lot less the latter. Z tries to break free…. 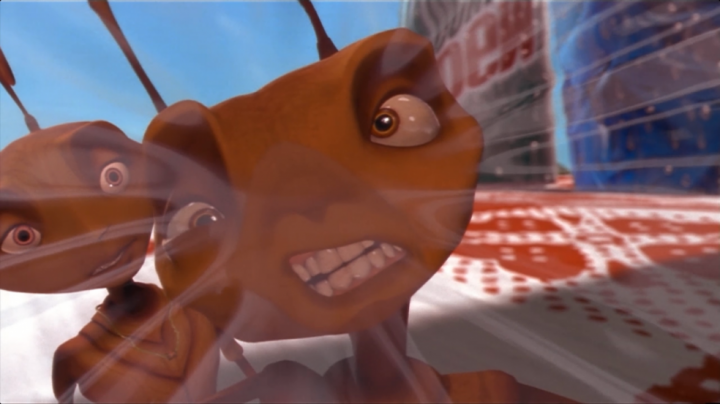 Antz, nevertheless, is still a whole bunch of fun, and if you can get past the strange animated style (strange given we’ve been brought up on crisp, clean lines and bright, shiny colors in ever other animated CGI film before and since) then there’s plenty to like about the film. "The erroneously apostraphe-d A Bug’s Life"
Please explain as I believe 'A Bug's Life' is grammatically correct. 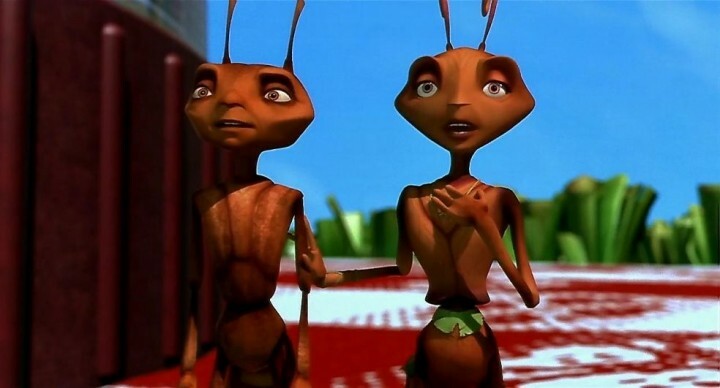 Also, I'd have to say that Antz brings me more entertainment, both visually and comically but perhaps A Bug's Life is a better film for young children although the constant fear of the Grasshoppers in A Bug's Life perhaps outweighs the 'darker tone' of the brief termite battle. 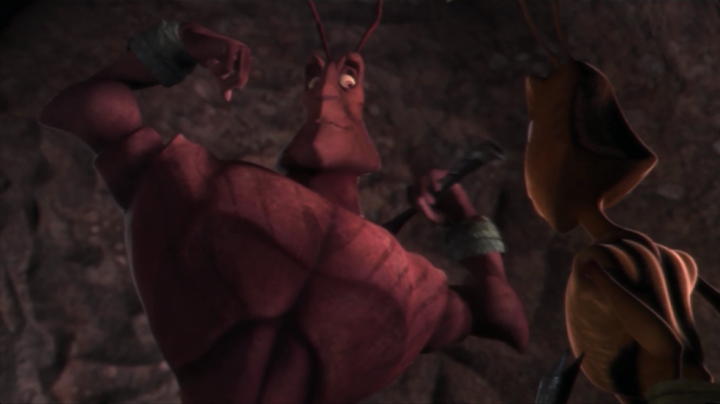 The shoe scene in Antz is fantastic while nothing stands out for me in A Bug's Life. For Me A Bugs Life its much better compared to Antz.Its is rewatchable,the visuals are nostalgic and brilliant(well thats a case on Pixar shows but not now),the actors though they are not very well known(actually you don't have to be known to voice in an animated film because in some cases a show with many A listers will turn wrong) turns out to become of the biggest stars today.Besides that A Bugs Life has the most original plot in any film history and it has brought influence to shows such as How To Train Your Dragon(another Dream Works show,but Rise Of The Guardians was also good and re watchable so as Megamind)and its one of the shows that has blown me aways aside from the Toy Story series and Monsters Inc. Guess that makes us buddies, Charpie, considering I like ABL a lot more than Antz!!! Thanks for dropping by!!! A bugs life sucked. Antz was way better.